About 13.5 billion years ago, matter, energy, time and space came into being what is known as the Bing Bang. The story of these fundamental features of our universe is called physics. About 300,000 years after their appearance, matter and energy started to coalesce into complex structures, called atoms, which then combined into molecules. The story of atoms, molecules, and their interactions is called chemistry. About 70,000 years ago, organisms belonging to the species Homo sapiens started to form even more elaborate structures called cultures. The author tells about three important revolutions that shaped the course of history: the Cognitive Revolution started about 70,000 years ago. The Agriculture Revolution sped it up about 12,000 years ago. The Scientific Revolution, which got underway only 500 years ago. This book tells the story of how these three revolutions have affected humans and their fellow organisms. It's an excellent book with all the facts and figures which we don't know. This book is thought-provoking and changes one's thoughts about history. The author tries to sum up as much as he can in this book but in my opinion, a single book is not enough for the brief history of humankind. It never will be. Although, the book is filled with the author's opinions. He believes that Earth is better off without humans. Some part of the book is very intriguing and some are so boring that you wish to stop reading. There is a lack of information about Neanderthals which made me unsatisfied. I like the scientific revolution part very much. This book tells how we evolve and about our genes and other interesting stuff. It's a must-read. This is the thrilling account of our extraordinary history - from insignificant apes to rulers of the world in which fire gave us power, gossip helped us cooperate, agriculture made us hungry for more, mythology maintained law and order, money gave us something we can really trust, contradictions created culture and science made us deadly. How did our species succeed in the battle for dominance? Why did our foraging ancestors come together to create cities and kingdoms? How did we come to believe in gods, nations and human rights? And what will our world be like in the millennia to come? Bold, wide-ranging and provocative, Sapiens challenges everything we thought we knew about being human: our thoughts, our actions, our power, and our future. Dr. Yuval Noah Harari has a Ph.D. in History from the University of Oxford and now lectures at the Hebrew University of Jerusalem, specializing in World History. His research focuses on broad questions, such as: What is the relation between history and biology? Is there justice in history? Did people become happier as history unfolded? 65,000 people have signed up to Harari's online course, A Brief History of Humankind. Sapiens is an international bestseller and is published in more than 30 languages worldwide. 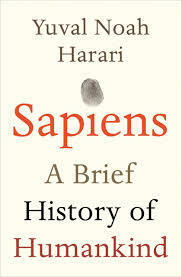 In 2012, Harari was awarded the annual Polonsky Prize for Creativity and Originality in the Humanistic Disciplines.